This product was added to our database on Wednesday 25 May 2016. Introducing the brand new Mega Airport Frankfurt 2.0 for Microsoft Flight Simulator X and P3D. This new version of Germany´s main hub includes all objects of the airport area according to todays official documents of the Fraport AG. The airport Frankfurt Rhein/Main has been modeled in extreme detail to the actual layout with usable taxiway bridges across the "Autobahn" connecting to the new runway "North". The aerial image of approx 140km² covers the towns of Eddersheim, Okriftel, Kelsterbach, Zeppelinheim, Walldorf and parts of Raunheim, creating that realistic feel when approaching the airport. Check out the new Lufthansa Terminal A-Plus as well as the new Terminal B with all its satellites. 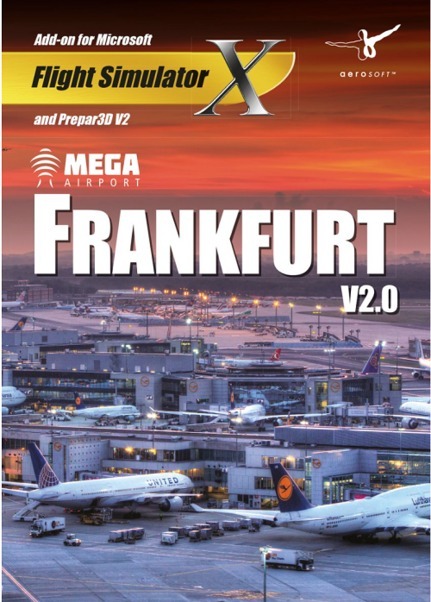 Make Mega Airport Frankfurt 2.0 your hub to the virtual flightsim world. All 3D objects of the airport area according to the official documents of the Fraport AG. Realistically scaled 3D objects of the complete Cargo City South with all buildings. 3D objects of the "Mönchhof" area when approaching the runway "North". 3D objects of the Gateway Garden area. Aerial image with customized autogen objects in the close vicinity of the airport. Additional aerial image of the airport area (8 X 6 Km). Usable taxiway bridges connecting the new runway "North". New Terminal B with all Satellites. Original taxiway signs as well as new taxiways in the south and sout-west. New ICE station "The Square" with parking lot and "people mover". Numerous new buildings at the airport. Textures (FSX materials) with 1024 and 2048 pixels.